My lovely wife was kind enough to gift to me a pair of new board games for my birthday this year. 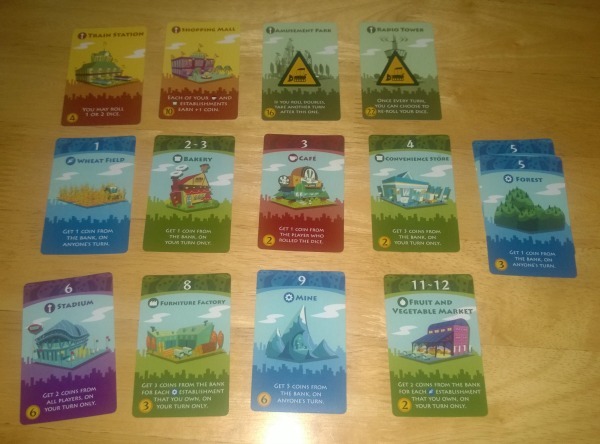 One of those games, Machi Koro, is a relatively simple competitive city-building game based on cards and die rolls. The other, Broom Service, is a fairly complicated worker placement game focused on delivering potions to towers. Let’s start with the easy one, shall we? 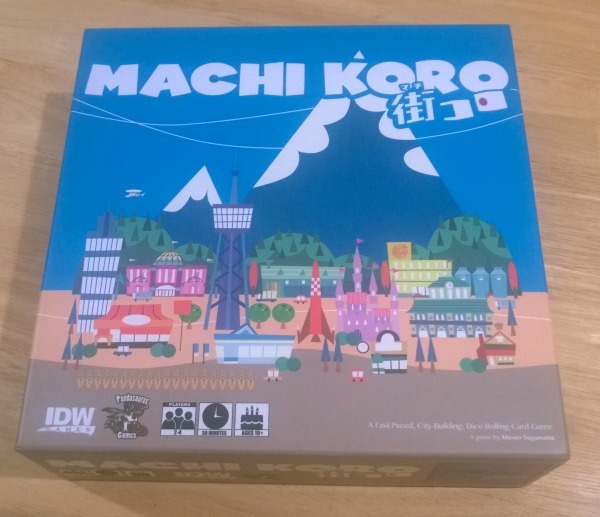 Machi Koro was designed by Masao Suganuma and published in 2012 by IDW Games and Pandasaurus Games. 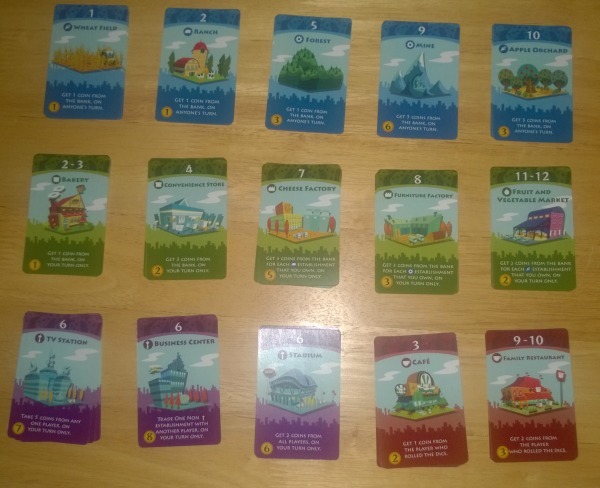 Described as a “fast-paced, city-building, dice-rolling card game,” Machi Koro can be played by between 2 and 4 players from ages as young as 10. Personally, I would describe it as a combination of deck-building and the dice mechanic from Settler’s of Catan. There are also two expansion packs, titled “Harbor” and “Millionaire’s Row”, which change the game rules significantly, but the base game is fairly simple. To be honest, the base rules are pretty easy, so I think that age limit can be pushed lower if the child is sharp. Setup can be accomplished in 5 minutes, assuming that the cards are put away correctly. Each player starts with four city cards face down in front of them (Train Station, Shopping Mall, Amusement Park, and Radio Tower). Additionally, they also start with a Wheat Field and a Bakery. The starting cards are identified by their different color backing (plus the city cards look different). The rest of the property cards are sorted by type and laid out in a manner that makes sense to the players. The first player rolls a single die, and then players take and receive payments based on what number comes up. Blue cards pay all players some value regardless of who rolled the die; green cards pay out only for the player that rolled the die; purple cards allow you to steal money from other players on a roll of 6; and red cards force other players to pay you if they roll that number on their turn. In short, there is always money changing hands. 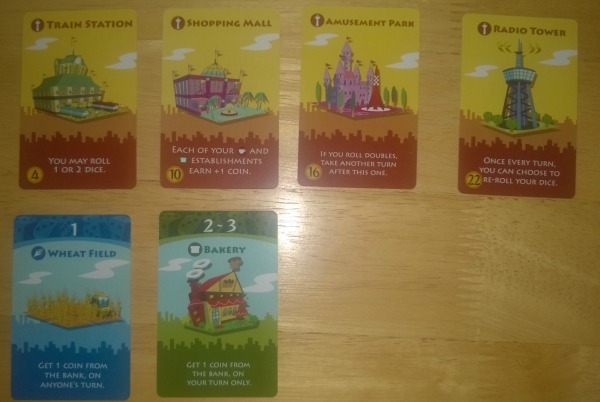 To finish out your turn, you can choose to buy a new card from the various available properties to shore up your city (i.e., increase your income), or buy one of your city cards (flip it over, activating it’s power). Play progresses like this until the first player buys all 4 of his city cards. For example, a roll of 8 for this player would result in 9 coins of income. There is really only one strategy for the basic game, which is to buy properties to cover the full range of possible die rolls to maximize your income. There’s also a certain amount of luck involved, as your only choice is whether to roll one die or two, which means you can only control whether you roll between 1 and 6 or between 2 and 12. Still, it’s light-hearted and fun, and also very cheap. You can pick up a copy of Machi Koro on Amazon for roughly $20. The “Harbor” expansion adds 10 new property cards and 2 new city cards. But the biggest change is in the way that players access those properties. In the base game, all 12 property cards are available to all players at all times, the only barrier to entry is the purchase cost of the cards. In “Harbor”, all 22 types of property cards are shuffled into a giant deck and then drawn upon to create a pool of 8 unique piles of properties. This means that it becomes very important to purchase certain, more powerful properties when they become available. In the base game, most of the players will end up with nearly identical cities. In “Harbor”, you’ll each end up with very different portfolios of cards available. “Harbor” is available on Amazon for approximately $15. I have only played the “Millionaire’s Row” expansion once, but if my memory serves, the primary purpose is to extend the game. Machi Koro can be played in roughly half an hour, but “Millionaire’s Row” adds additional city cards to purchase and 13 additional establishments focused on increasing the exchange of money between players. Massive sums of coin pass through your hands, coming and going at the whims of the dice. This expansion is somewhere around $20 on Amazon. On one hand, Machi Koro is light-hearted. On the other hand, if you end up having an unlucky night, it can be brutally mean. The good news is that it’s fast and it’s easy to set up, and can be played by a large age range. The cost of entry is also much lower than most board games these days, even if the common consensus is that the “Harbor” expansion is almost a prerequisite to play more than a few times. I personally really enjoy Machi Koro quite a bit, but it will come down to whether or not you like the random aspect associated with the dice rolls.